Many cell owners sleep next to their phones so as not to miss calls, messages, or updates during the night. They also check their phones for messages even when not prompted by their phone to do so. As might be expected, younger cell owners are especially concerned about missing calls or notifications on their phones. Six in ten cell owners between the ages of 18 and 34 say that they have slept next to their phone so as not to miss any calls, texts, or other updates during the night; and three quarters of cell owners in this age group say that they check their phone for messages even though they did not hear it ring (indeed, 25% of young cell owners say that they do this “frequently”). At the same time, even among seniors, this behavior is not unheard of. Nearly half of seniors (46%) say that they have caught themselves checking their phone for messages or missed calls even though they did not hear their phone ring or otherwise give some sort of notification (although just 5% say that they do this “frequently”). Similarly, some 22% of cell owners ages 65 and up have slept with their phone next to their bed so as not to miss any messages or calls while they were asleep. 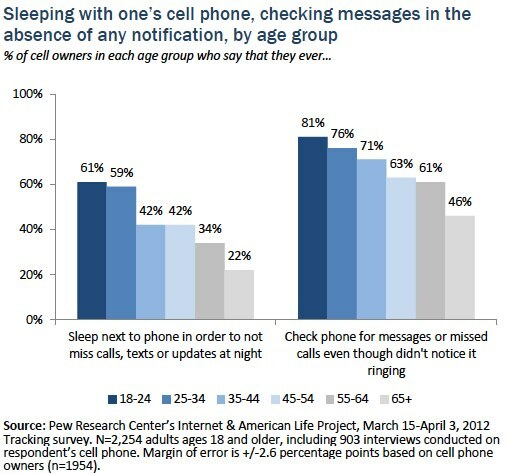 Along with young adults, sleeping next to one’s phone so as not to miss anything during the night is especially common among smartphone owners (50% of whom have done this) as well as those who go online mostly using their cell phone (60% of “cell mostly” internet users have done so). In addition, some 53% of African American cell owners say that they have done this. These same three groups (smartphone owners, “cell mostly” internet users and African American cell owners) are also apt to check their phones frequently without an obvious reason to do so. Some 31% of “cell mostly” internet users do this frequently, as do 23% of smartphone owners and 24% of black cell owners. Parents also tend to have a quick trigger finger when it comes to checking their phone for messages — 23% say that they do so frequently. Cell owners are more likely to get complaints for not checking their phone frequently enough or answering quickly enough, than for spending too much time with their phone. As with many of the trends discussed in this report, most demographic differences on this question center around age. In particular, younger cell owners are much more likely to say that they get complaints about spending too much time with their phone, and to get complaints that they don’t respond promptly enough to calls or texts. Smartphone and non-smartphone owners are equally likely to get complaints from friends that they don’t check their phone frequently enough. However, smartphone owners are a bit more likely than other cell owners to hear complaints that they don’t respond promptly to calls or text messages (42% vs. 35%) and are much more likely than other cell owners to hear complaints that they spend too much time using their cell phone. Some 19% of smartphone owners say that this happens to them, compared with just 5% of non-smartphone owners. One in ten cell owners express worry that they spend too much time on their phone. Young adults, smartphone owners and iPhone adopters lead the way on this concern. 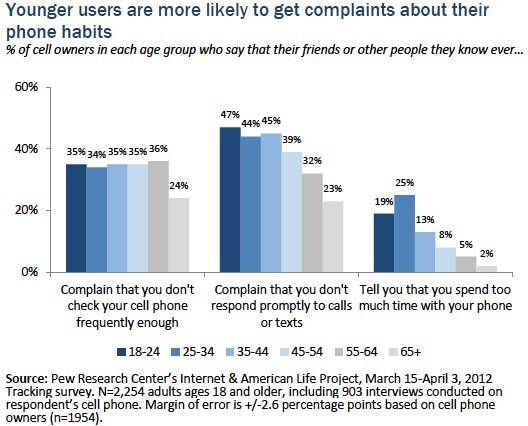 As noted above, 12% of cell owners say that someone else has complained that they spend too much time on their phone. A similar number — 11% of cell owners — say that they themselves sometimes worry that they are spending too much time on their mobile device, although the vast majority of cell owners — 89% — say that they never worry about the amount of time they spend using their phone. Younger cell owners are especially attuned to this concern. Some 21% of cell owners ages 18-24 say that they sometimes worry that they are spending too much time on their phone, compared with 14% of 25-34 year olds, 14% of 35-44 year olds, 9% of 45-54 year olds, 5% of 55-64 year olds, and 3% of cell owners ages 65 and older. Smartphone owners also stand out from the pack (15% of smartphone owners worry that they spend too much time with their phone), as do those who do most of their online browsing in the context of their cell phone (23% of these “cell-mostly” users say that they worry about this). Within the smartphone universe, iPhone owners are especially concerned about the amount of time they spend with their phones — some 22% of iPhone owners worry about how much time they spend with their devices, double the proportion of Android (12%) and Blackberry (11%) owners who share this concern. Others using their phones in a loud or annoying manner in public – still a frequent occurrence, but less frequent than it used to be. In addition to asking people about their own experiences with their cell phones, we also included two questions in this survey dealing with cell phone etiquette issues. First, we asked all respondents to our survey (including both cell owners and those who do not have cell phone) how frequently they encounter other people using their cell phones in a loud or annoying manner in public. These findings indicate that this annoyance is still persistent — but that it is growing slightly less commonplace over time. Overall, some 74% of adults say that they witness this type of behavior “frequently” or “occasionally,” while 25% say that they witness it “rarely” or “never.” However, the proportion of adults who say that this happens to them frequently has decreased significantly in the last six years. In March 2006, half (50%) of all adults said that this happened to them frequently, compared with 39% who say so today. Witnessing poor cell phone etiquette is relatively common across a wide range of demographic groups, although women are more likely than men to experience this behavior “frequently” or “occasionally”; whites are more likely to have experienced it than non-whites; those with at least some college education and those with a household income of $50,000 or more per year are more likely to experience it than those with lower levels of income or education; and urban and suburban residents are more likely to experience it than rural residents. 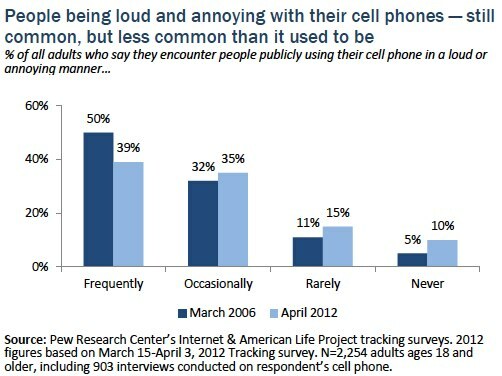 Most witness others using their phones in a loud or annoying manner, but few admit to doing so themselves. Although most Americans (including most cell owners) have witnessed other people behaving in a loud or annoying manner using their phones, just 6% of cell owners say that they themselves have drawn criticism or dirty looks from someone else because of the way they were using their phone in public. This is largely unchanged from the 8% of cell owners who had experienced this the first time we asked this question in early 2006. Some 11% of 18-29 year old cell owners have had someone respond in this way to their phone use, compared with 6% of 30-49 year olds, 3% of 50-64 year olds and just 2% of cell owners ages 65 and up. 29% of all cell owners (and 36% of smartphone owners) “couldn’t imagine living without” their cell phone. We asked this question in early 2006, and since then the proportion of cell owners who say that they “could live without” their cell phone has actually gone up — from 29% of cell owners in 2006 to 37% of cell owners today. The proportion saying that their phone is something they “can’t imagine living without” has remained largely unchanged — 26% of cell owners said this in 2006, while 29% said so in 2012.